You might want to use a car insurance calculator to see how much you can expect to pay for your insurance premium before actually signing up for a policy. Auto insurance calculators simply take your information, plug it into an algorithm, and then spit out some results. To further understand how these calculators work, you have to first understand how insurance companies come to determine your insurance rates. Continue reading below to learn more about the ins-and-outs of insurance calculators. 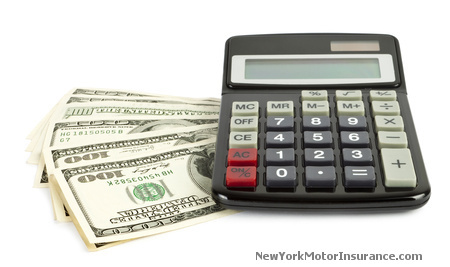 In this article, you will learn how insurance companies calculate your insurance rates and also how NewYorkMotorInsurance.com makes it easy for you to calculate your quote. The most common factors insurance companies will look at when determining your premiums include your age, gender, driving history, and your vehicle. There are actually hundreds of different things that come into play when assessing the risk you pose to insurance companies, but if we looked at each one individually we’d be here all day. Instead, let’s take a look at some of the more basic and most influential factors. It should come as no surprise to you that younger drivers end up paying the most for car insurance. Years of data (and common sense) suggest that inexperienced drivers cause more accidents and therefore cost more money. Teenage drivers, students, and those in their young twenties pose more of a risk to insurers because of their recklessness on the road, lack of experience, and the astounding rate that they get into accidents. Actuaries have looked at data and determined that those aged 16-26 should pay the most for insurance premiums. If you are in this age group, you should expect to pay the more than middle-aged individuals with lots of driving history and experience. The stereotype that women are worse drivers than men might not actually be true. Statistics suggest that women are at least safer drivers than men. They get into fewer accidents and cause fewer fatalities on the road. Men are also more likely to drink and drive, drive with reckless abandon, and even drive without wearing their safety belt. Because of data like this, men can expect to pay more for car insurance than women. If you have a lot of citations on your record, you might be in for a nasty surprise when your insurance rates are calculated. You need to maintain a pristine driving record if you do not want to be lumped into that “high risk” category that pays through the roof for car insurance. While there are ways to get these points removed from your license and get these violations removed from your permanent record, it’s often times more trouble than it’s worth. It’s better to just be a safe driver and never have to worry about these insurance premium hikes. The car you drive might be the most telltale sign of how much you are going to be paying for car insurance. Luxury cars and sports cars are most likely to warrant higher premiums. Safer, more “boring” vehicles will most likely cost less to insure. The more expensive the vehicle is, the more prone it will be to theft and vandalism. Expensive cars will also cost more to repair in the event of an accident. In addition to the make and model of your car, vehicle history also comes into play. If the vehicle you drive sustained a lot of damage in an accident, expect to pay more for insurance. If the vehicle had a lot of repair work done on it in the past, you can also expect to “pay a premium” for your premiums. This is one of the reasons why it is always so important to run a CARFAX report on your vehicle before buying it secondhand. The insurance quote tool on NewYorkMotorInsurance.com will take this information and give you a quote based on the information we are given. Since we do not request personal information such as your social security number in our quote calculator form, we can only give you a basic quote. It is the most accurate rate we can give you without being too nosy. If you would like to get a concrete rate to insure your vehicle, you will need to get quotes directly from different insurance providers. To begin calculating your rates here on our website, scroll up to the top of this page and enter your zip code. The next two pages will ask you for some basic information about yourself and your vehicle. By the third page, your insurance quote will already be in the process of being calculated and you will then receive premium rates from the top insurance companies in the US. I would like some information on new York motor insurance I’ve been with usaa for 25 years without a problem but in the last 1.5 years I’ve had a problems I’ve been in 5 accidents 4 of them being totaled I’m looking at progressive but know if they will take me or not. usaa said I should look at you guys my ins ends july 10 2017.